Bookings are open for the May 2017 Lecce Italian Language Experience from 2 May - 26 May. This offer is in USD, GBP and EUR as a land content package for people from the USA, the UK and Europe. Travel to and from Lecce not included. Flexible arrival and departure dates before and after the course dates (2 May - 25 May). Day trips – along the Adriatic Coast, and to Gallipoli, Otranto and Galatina. Pleae email me for more information. 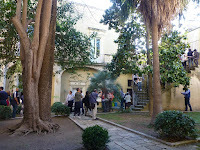 What clients are saying about Learn Italian in Lecce.